ISN leverages grant funds, donations, and cost-share from landowners to treat high-priority invasive species in high-priority places. Early Detection & Response: The highest priority are species that are just arriving in our area, but are known to do damage in others. This includes invasive black swallow-wort control efforts. Satellite Populations: Managing small populations of priority species is the best way to pick “winnable battles” and stop small populations from turning into big ones! Source Populations: Too big to be completely eradicated, the goal in managing large “source” populations is to bring them down to a manageable level while reducing chances of it spreading elsewhere. Japanese Barberry Trade-Up Day was created to encourage the removal of this highly invasive ornamental plant species. The plant is widely sold as an ornamental, so landowners were encouraged to remove barberry plants from their landscape and in return received a $5.00 coupon for a non-invasive alternative - up to $50.00. The coupons were accepted by select Go Beyond Beauty participants. Bio: Jane Kramer is a fine art photographer in East Lansing and recipient of the 2012 Individual Artist Grant and 2013 Chris Clark Fellowship from the Arts Council of Greater Lansing. After being selected as one of four Michigan artists to participate in an art and exhibition exchange between Michigan and Shiga, Japan, she began her series titled "Foreshadowing - Endangered & Threatened Plant Species". For this project, Jane photographs the shadows of endangered plant species and transfers the images onto paper made from the invasive plant species that threaten them. A portion of each print sale is donated to Michigan Nature Association. "Foreshadowing" has been featured on Michigan Public Radio's The Environment Report and was selected for inclusion in Grand Rapids' ArtPrize 2016. Gallery Opening Presentation: Jane talked about the process of collecting invasive plant species, turning plant biomass into pulp and paper, and photographing the shadows of endangered plant species. 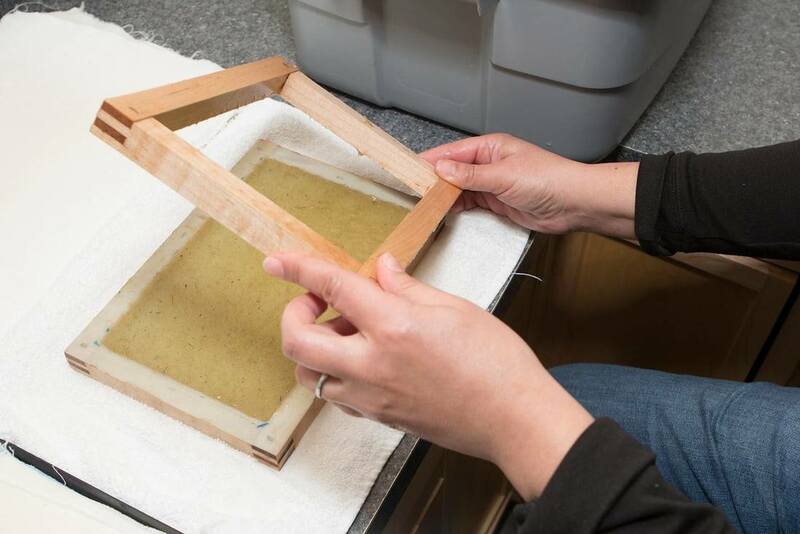 Workshop: Participants got creative with Jane Kramer to learn hands-on the process of turning invasive garlic mustard into beautiful, archival-quality paper! ISN offered businesses the opportunity to have Japanese barberry removed from their landscape and replaced with natives species at no cost! Qualified Go Beyond Beauty Landscapers and ISN staff worked with businesses directly to coordinate the barberry removal and help choose non-invasive plants to be installed in their place. Full details on 2017 event. Visit Go Beyond Beauty home page for additional details on past programs, as well as landscape and nursery participants. Add ISN's events and workbees to your calendar!